I wanted to come up with a beginner’s level baby afghan pattern, so I thought what can be easier than a V-stitch. This baby blanket is quite small in size; it’s a preemie size. The reason I made it small is because I want to donate it for a charity that provides hospitals with handmade baby blankets and hats. They need baby blankets in preemie sizes as well as regular ones. 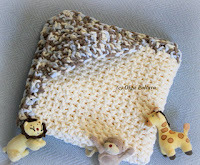 The blanket is super easy and quick to make. And, of course, with little adjustments it can be made in a bigger size. Size: Approximately 28 inches (71 cm) square. V-st in this pattern is (dc, ch 1, dc) all in same space. Row 1: V-st in 4th ch from hook, *sk 2 ch, V-st in next ch* across, dc in last ch. Ch 3, turn. Row 2: V-st in next V-st across, dc in 3rd ch of turning ch-3. Ch 3, turn. Repeat Row 2 until you have 58 rows in total. Do not make turning ch 3 in the last row. Working in end of rows: ch 2, hdc in same space, *ch 1, 2hdc in next space* across. Ch 1, (2 hdc, ch 3, 2 hdc) all in corner space. Working into original chain: *ch 1, 2 hdc in next ch-2 space* across. Ch 1, (2hdc, ch 3, 2 hdc) all in corner space. Working in end of rows: *ch 1, 2 hdc in next space* across. Ch 1, (2 hdc, ch 3, 2 hdc) all in corner space. Working in last row: *ch 1, 2 hdc in next V-st* across. Ch 1, (2hd, ch 3) all in corner space. Sl st to join the round. Sc in space between next 2 hdc, *4 dc in space between next 2 hdc, sc in space between next 2 hdc* across. 6 dc in corner space. Sc in space between next 2 hdc, *5 dc in space between next 2 hdc, sc in space between next 2 hdc* across. 6 dc in corner space. Sc in space between next 2hdc, *5 dc in space between next 2 hdc, sc in space between next 2 hdc* across. 6 dc in corner space. Sl st to join the round. Another wonderful pattern....thank you! Looks like a keeper! I just love it Olga and may make it soon. Thank you for the pattern! :) Happy Mother's Day! The beauty is in the simplicity ! It's so delicate and pretty! Thank you for sharing with the Clever Chicks Blog Hop this week! Starting it now, going to try to make it bigger! I just love this pattern. I too make baby blankets all the time. I would like to make a bigger version of this blanket and think I would need to increase the number of beginning chains by groups of three chains ie 3,6,9. Is this correct? Thanks so much for sharing all of these lovely patterns. By the way I made a blanket using the pattern your mother uses. So pretty. Hi Nancy, the pattern is a multiple of 3. So you are correct; you will need to increase the original chain by a number that is divisible by 3 (3. 6. 9, 12, etc). Thanks,Olga, for the quick response to my question. Can't wait to make this blanket. Oh, I totally forgot about the trim. If you look at the picture of the trim, you will see that each "scallop" is made over 2 V-stitches. This means that if you want to make the same trim, you need to increase your blanket by a number divisible by 6 (6, 12, or 18). Because if you increase by 3 or 9, you will end up with half of a "scallop" on the trim. I hope this make sense. Oh and one other question. When you made the preemie size how much of the Pound of Love yarn did you use? Some or all of it? Thanks. I used about half of Pound of Love, maybe slightly more than a half, but I still had a lot of yarn left. Hi Olga. thanks again for the pattern! I have been working on this one and I am finally at the end. Unfortunately when I am doing the Round 2 in the trim, I have a problem in the corners. I repeat the 1sc between 2hdc, 4 dc between 2hdc and I when I reach the corner, I end up with 4dc between 2hdc and immediately have to do the 6dc in he corner. This makes the whole thing look wrong. I thought I made less than 57 rows but I counted and I actually made the 57 . Any suggestion? Thanks! Hi Ryan, I can't figure out your problem right away, and I don't even have this blanket anymore to take a look and compare it with your description. What would help if you could e-mail me a detailed picture of your corner (see my e-mail address in my profile). Thank you! You helped me find an error in my pattern. It should be 58 rows in total. Hi, I have just started this blanket using left over balls of wool I had, just to try it out before I do it in an appropriate colour for a friend. Can anyone tell me how much wool I need to complete it? Also, if you do want to do it in a larger size, say for an 8lb baby, how many chain should I start with? Thank you. I've just read the previous posts and see my questions have been answered already. Thanks. Thanks for sharing your creations with us! They are beautiful! Being a beginner, your work has inspired me to take on the challenge of the V-stitch Baby Afghan. I have hit a road block while working in end rows for the edging. Could you please do a photo tutorial just like the "Crochet Scalloped Trim Tutorial". I want to make the same Scalloped Trim that you have made for the V-Stitch Baby Afghan, and don't know where exactly to work in the end rows. Thanks and may God Bless you for inspiring us. thanks for the pattern! I used double strands and made small receiving blanket sizes...finished with a border instead of edging and it turned out so sweet. I'm posting on my blog Thursday if you want to see the finished product. oops...forgot to add that I ALWAYS link back to the original pattern/inspiration so you have a link on my post leading back to you, giving you credit! This is beautiful and so easy; thank you so much for sharing! very nice looking pattern i have noted down with a wish to make it soon. thank u for the lovely pattern. Your patterns are beautiful. I am going to try your V Stitch baby blanket for my great granddaughter. I am new to crochet and would love to try the v-stitch baby blanket. My only problem is I would like to make this a little larger than a premie size. Any help would be greatly appreciated. I just finished this blanket for my sweet new niece that is in the NICU. She was born weighing 1 pound 13 ounces. She now weighs 4 pounds. I can't wait to see her wrapped in it. thank you for the pattern.